5 Reel, 20 Payline non-progressive video slot with a top award of 250 000 currency credits. Featuring Scatter and Wild Multiplier symbols, Free Spins Bonus Round with a 50x multiplier. Bitten follows the worldwide fascination with the Vampire culture and their immortal fortunes! Raid the tomb of a great Vampire and steal the wealth she’s amassed over her undead years. Enter this enticing world with retro gothic graphics and ghostly The 2 teeth of the Bitten Logo drip with blood, also find trails of blood...and eerie music! 3 or more Crypt Bonus Scatters appearing anywhere on the reels will activate the Crypt Free Spins Bonus Round game. The Crypt Bonus Scatter doesn’t need to appear in a line on an enabled payline to win. The Wild symbol serves as a Wild and Bonus symbol. It also replaces all the symbols besides the bonus to create winning combinations. The Wild also pays out scatter wins when 2 or more are found anywhere on the screen. Land 5 Wilds and collect 250x the total bet for that spin before entering the Crypt Free Spins Bonus. 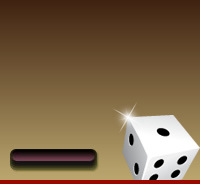 Bitten is also a Wild Multiplier symbol which means it acts as a substitute for other symbols to complete winning combinations and multiplies the payout. Win up to 20 Free Spins when 3 or more Scattered Crypt Bonus symbols appear anywhere on the reels. This will also activate the Crypt Free Spins Bonus Round. Play the Free Spins with an increasing Bonus Multiplier that multiplies all payline and scatter wins! The Free Spins can be retriggered multiple times, earning up to 50 x Bonus Multipliers! When the Free Spins Bonus round is activated a number of coffins will appear. 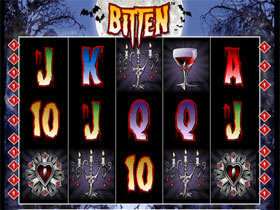 Choose 1 coffin to reveal the amount of free spins to be played, maximum 20 free spins. st Free Spin. The Multiplier value will grow by 1x for each subsequent Free Spin, up to a maximum of 50x! Free Spins will be played out automatically. The Payout Schedule : The value of credits won depend on the coin size bet. All figures show the amount of coins that are won for each combination. Bitten is a definitely a game for fans of anything to do with vampires and horror stories. At the same time slots players will appreciate the generous free spins and payouts. Aladdin's wishes came true when he discovered his magic lamp and the powerful genie. Make yours come true too with this great RTG Slot game. Test your shooting skills by capturing Aliens that appear on your screen. One of the 1st skill games by Playtech. Get the Egg Alien feature too. Get 3 Lucky eagle Coins and choose your free games. Get up to 60 free spins at 3x multiplier with this great Microgaming slot game.